Kris Fondran is one of the most dedicated inline skate instructors on the planet. She started out on the ice and has been teaching a variety of skating disciplines for over 25 years! We felt it was time to talk to her and find out more about her life on and off skates. Kris, you have been on skates for nearly your entire life! Can you explain how this has shaped you as a person? From the first time I stepped on the ice I fell in love with skating. My first love was figure skating where I competed in local and regional competitions and took skating tests through United States Figure Skating (USFS). In the late 80’s I bought my first pair of inline skates and would get together with other figure skaters and hockey players to skate for fun. The transition from ice skates to inline skates was seamless. It was a low impact, high satisfaction activity that felt great. Given that I was also a marathon runner at the time I quickly recognized the cardiovascular and muscular benefits as well as the advantage of giving my body a break from running. In the early to mid 1990’s, when inline skating was booming in the US I was introduced to the International Inline Skating Association’s Instructor Certification Program (ICP) by a local skate shop owner in Cleveland, OH. First as a certified instructor in 1995, then as a program examiner and eventually the director of the program in 1998, it has been all ICP ever since. Being involved with the ICP all these years has provided me with the opportunity to meet so many passionate skaters and instructors around the world enriching my life in ways that I could not have imagined. Over the years there have been countless travel opportunities (1 million lifetime flight miles here I come!) and I now have friends all around the globe. And it all goes back to my love for skating and that phone call to a local skate shop! I recently had a very big birthday – the big 50. I am convinced that all my years of skating and teaching have positively influenced my level of health, happiness and outlook on life keeping me young from the inside out. It goes back to being a competitive figure skater and runner. You will not find success in either if you give up easily. Given the fact that I have been teaching skating for more than 25 years and directing the ICP for 19 years, clearly I do not give up on anything easily! I am either dedicated or I am done. Besides being a skating instructor you also have a master degree in exercise science and teach part time at a university. 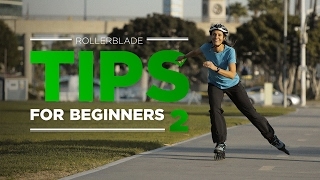 In previous video’s on our Rollerblade® youtube channel ( tips for beginners ) you explain the benefits of skating. Could you please refresh our memory with a summary of the best parts? Skating for fitness is the reason why many people choose to skate. Skating is a full-body, easy-on-the-joints workout that can improve cardiovascular respiratory function, muscle strength and endurance and body composition. In a study that I conducted this past summer with colleagues and students at Cleveland State University, we even found that inline skating regularly improves core stability and strength! Skating takes us out of the gym or fitness center and allows us to move freely into beautiful surroundings (think parks) or exciting outdoor (think city/urban) settings. All you need is a good pair of skates, Rollerblade brand of course, and to become familiar with the basics of moving and speed control, and you will be amazed by how much fun a great workout can be. Apart from physical benefits, skating improves the mindset of the skater. What can you share with us from that point of view? For years I have been teaching yoga to a variety of athletes-hockey players, figure skaters, basketball players, baseball players, etc. The connection between the yogic principles of body and movement awareness and athletic performance were very evident to me. So in 2010 when Rollerblade approached me to develop a workout, which ended up being the “Mobile Yoga Workout” www.mobileyogaworkout.com, that highlighted the connection between skating and yoga, it made complete sense. Both skating and yoga are easy on the joint activities that can facilitate a connection between movement and breath leading to a rhythmic, meditative experience. I believe that connecting to the rhythm of the breath, and awareness of the push and glide motion of skating, can reduce mental stress and increase clarity of mind in the same way that yoga can. For me, skating is the perfect moving meditation. The ICP focuses on the development of talented and passionate skating instructors who, through the practice of safe and effective inline skating instruction, are bringing more people to the sport world-wide. How is this program evolving? 1: Inline skating is accessible to nearly everyone. 2: It is a relatively inexpensive sport that can be done just about anywhere. 3: For an optimal experience learn to control your speed and stop. 4: Inline skating burns about the same amount of calories as running with much less impact on the body. 5: Skating has been know to induce spontaneous smiling. Seriously. Go skate and see for yourself!